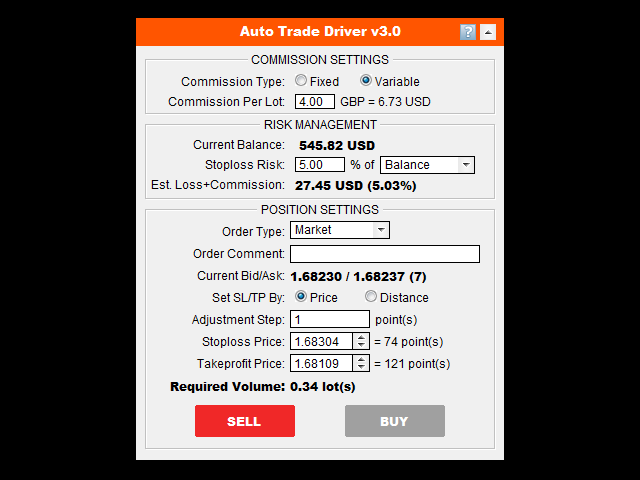 Auto Trade Driver is an automatic powerful tool (run as Expert Advisor) that helps you to manage risk and control orders and maximize your profit in multi-protect/trailing-stop rules. This tool is very useful for both scalpers and trend followers. It not only calculates the trade risk exactly, but also protects and maximizes your profits in real-time. 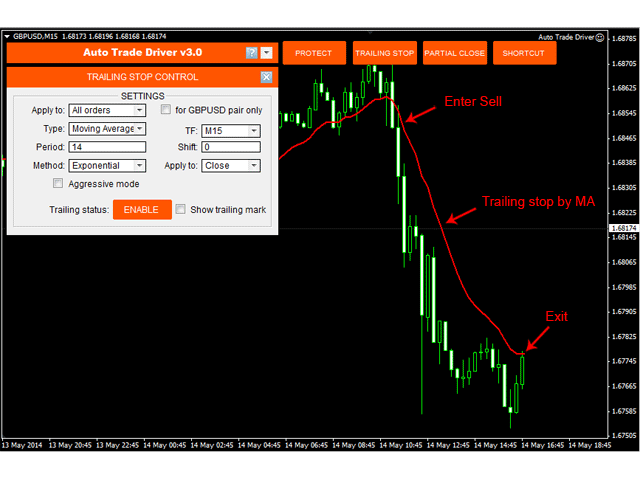 With this tool, the only thing you have to do is to enter trade by your own strategy, then it will auto-drive your position with exit strategy you chose. This panel is used to calculate required volume that meets your accepted stop loss risk. 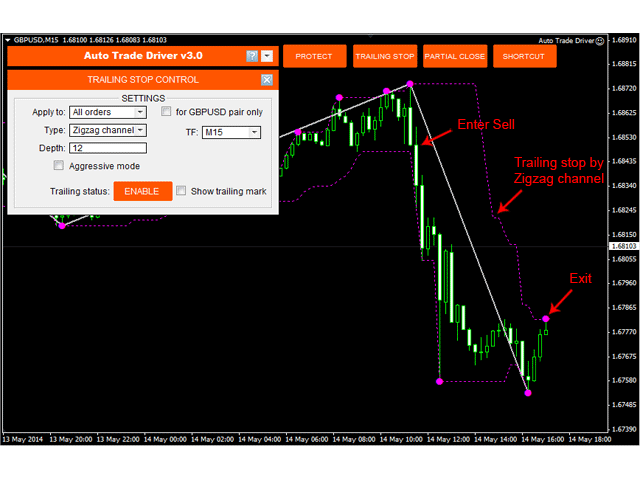 You choose EP and SL with a specified risk percentage of balance that you accept to lose at that stop loss point (including commission), the tool will auto-calculate required volume. Then, you just need one click on the button BUY, SELL, or PLACE ORDER (with pending order), and order will be sent immediately. If you want to calculate and place order with other pairs, just use this tool with those pairs. Commission Type: This is how your broker charges commission. It's "Account currency" if commission is charged on account currency unit, and "Base currency" if commission is charged on base currency of trading pair. Commission Per Lot: The amount of currency units that charged as commission for a round turn standard lot. If your broker/account type doesn't charge commission, just leave this value as zero. Stoploss Risk: The risk percentage that you accept to lose if stop loss occur. Set SL/TP By: Choose how to set Stop loss/Take profit point. It's "Price" if you want to set SL/TP by a certain price value, "Distance" if you want to set them by a distance from the entry point. Stoploss/Takeprofit/Distance: Value to determine the Stop loss/Take profit point. Setting Stop loss point is mandatory to calculate appropriate volume (you may remove Stop loss later if you want, but need to enter a value to calculate volume and place order). Leave Take profit as zero means setting an order without take profit. Order Dragging feature: When you are setting EP/SL/TP on the control panel, you will also see that there are horizontal lines with corresponding level on the chart. You can select those lines and drag them to adjust order EP/SL/TP. Due to those level, order type will be auto selected. 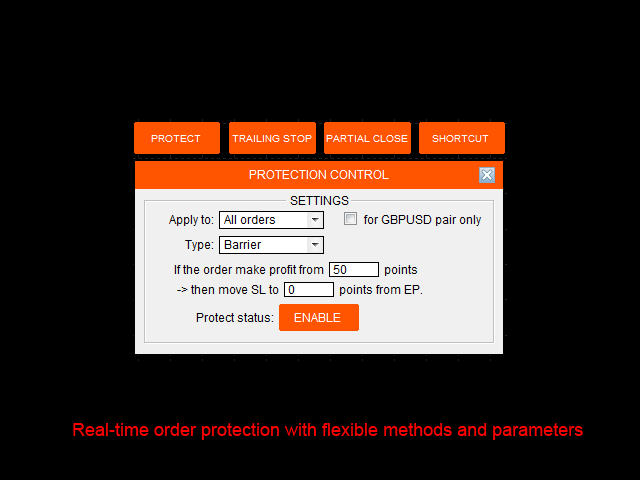 Barrier: When order make profit at X points, then stop loss will be moved to Y points from EP. ATR value: Average True Range (ATR) determine the average volatility of price at the meantime. So, trailing base on its value is favorite choice of many traders. 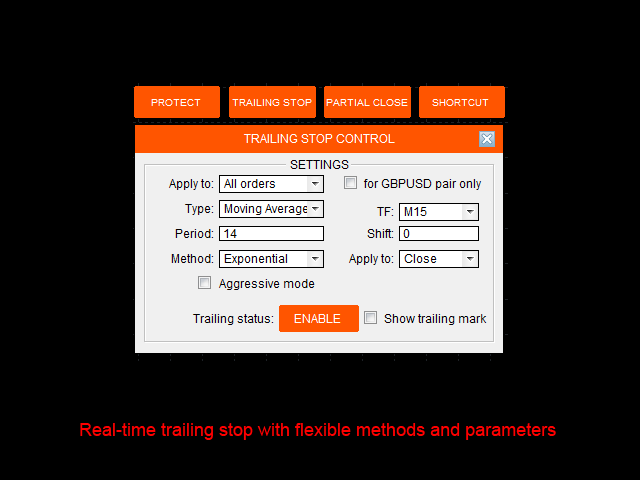 Aggressive mode: Check this box if you want to trail stops from the order's opening base on price value (original stop loss distance may be reduced step by step). 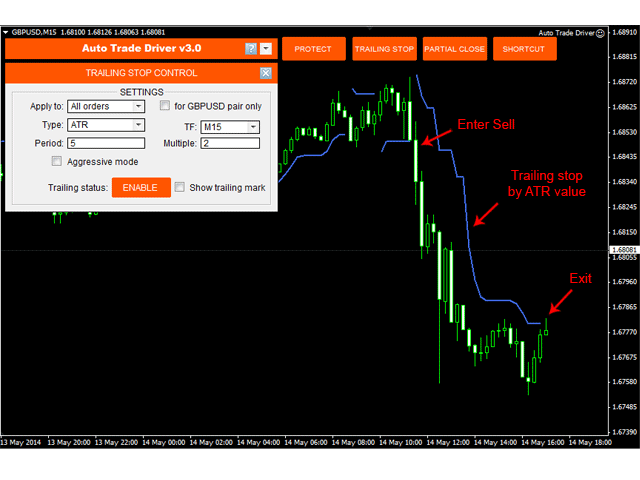 Unchecking this box will make trailing-stop to take effect only when trailing-point makes profit only. 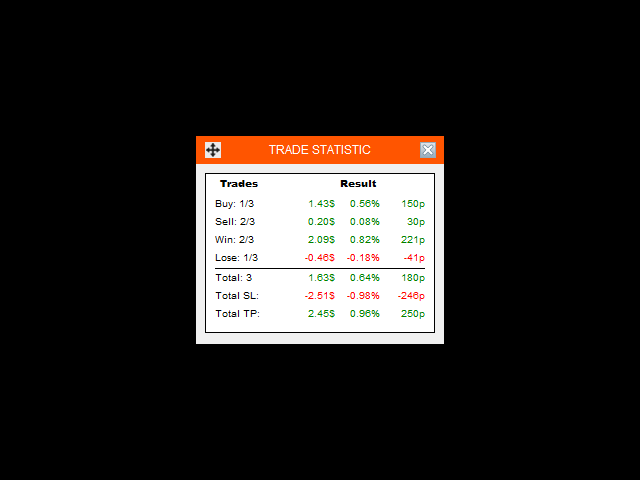 To view trade statistic panel, just go to Setting menu --> Show trade statistic. This panel helps you to overview your account statistic in the mean time, which includes Buy orders, Sell orders, Winning orders, Losing orders, Total potential SL and Total potential TP. 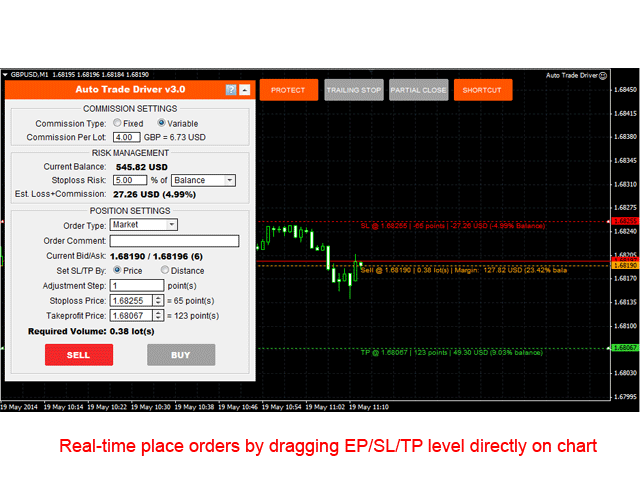 Allows to adjust EP/SL/TP points before you place an order by dragging directly on the chart. Auto-recognizes pending order type based on EP and SL value. 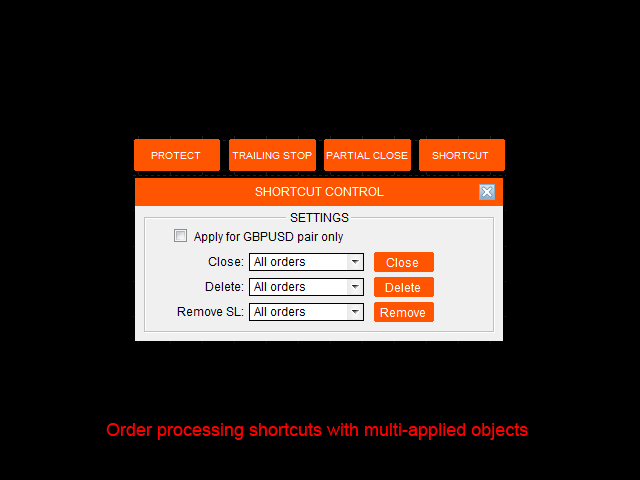 No more mistake in choosing Stop or Limit order. No need to re-load Expert when changing parameters, everything changes directly on control panels. Auto restores the previous settings and status after terminal restart or power-off. 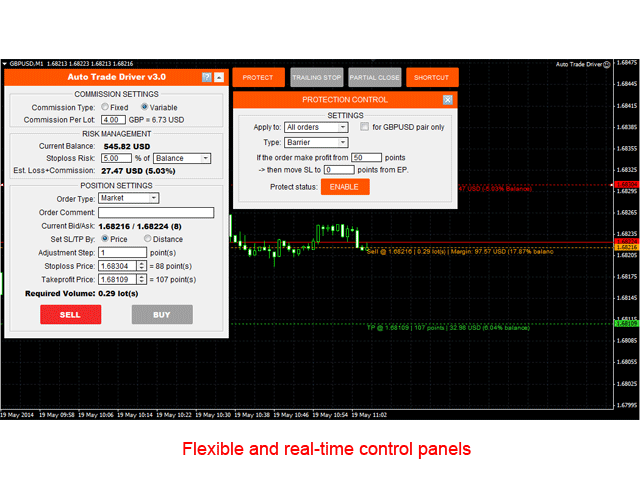 Flexible/minimize-able control panels that save the chart space. Protects and trails stops without the limitation of Stop/Limit level set by broker. Allows to apply on multi-charts to follow multi-rules with "First-come first-served" basis. - Fixed: Correct partial close for minimal lotsize. - Improved: Update SL & TP according to actual EP for market order. Fixed hang-up when account login changed. Fixed minor bugs with cross pair.